As a small business owner, you’re a creative person. It’s time to show your creativity and give your business cards, brochures and other marketing materials a bold new look all at the same time. Brother, manufacturers of printers and related business products, has a free Web tool that can help you use your creativity to design the perfect show-stopping, jaw-dropping business materials for your company. All it takes is Internet access and a bit of imagination. You’ll be printing up your new designs and turning the heads of customers and the competition. We’d like you to try the Brother CreativeCenter — a totally free web-based design portal — to put some pizzazz in your next business card, calendar, poster, brochure or mailer. And we’re offering a whopper of an incentive! Enter the Brother “Back to Business” Contest for a chance to win one of three prize packages worth over $500 each. 1. Visit the free Brother CreativeCenter design portal. 2. Create your brochure, mailer, poster, calendar or business card. 3. Submit the entry to the Brother CreativeCenter “Back to Business” Contest on BizSugar (see details below). 4. Three winners will win a Brother prize suite – approximate value of $500 including a color inkjet printer from Brother and related supplies. Who: U.S. residents aged 18 and older. 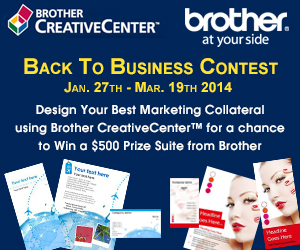 What: Brother CreativeCenter “Back to Business” Contest. When: Now through March 19, 2014 at 11:59 pm Eastern time (Eastern Standard Time). Winners will be announced the first week in April 2014. Remember to keep watching all submissions here. We’re excited to see what your creativity can do – Get started NOW!